“The kingdom of heaven is like a landowner who went out at dawn to hire laborers for his vineyard. After agreeing with them for the usual daily wage, he sent them into his vineyard. Going out about nine o’clock, he saw others standing idle in the marketplace, and he said to them, ‘You too go into my vineyard, and I will give you what is just.’ So they went off. Christianity Today had a brief piece making the allusion, which also came up in the NY Times followup. The reference isn't necessarily complimentary to the workers are Gravity who have objected to the new wage structure, rather like being accused of being like the older brother in the parable of the prodigal son. 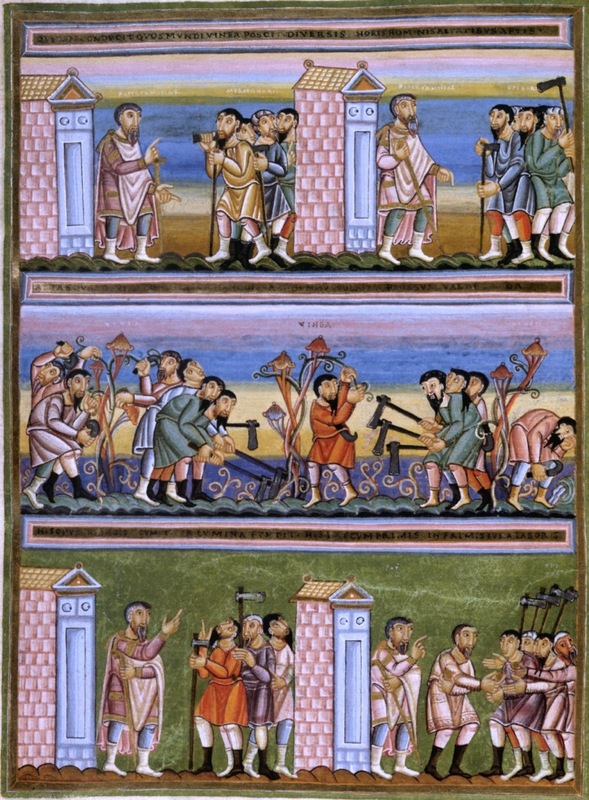 I think it's an interesting Biblical allusion to bring up, because in many ways I think that social justice advocates (by which I mean those who self consciously think of themselves as such, not the wider world of those who care about justice in society) would not like a labor market which functioned in the manner of the Parable of the Vineyard. Before discussing that, however, it's a good idea to start by looking at what the actual purpose of the parable is. Jesus often told parables in which some everyday, secular example was used to make a point about secular reality. Sometimes the secular example isn't even an example of virtuous behavior. For instance, in the Parable of the Dishonest Steward, Jesus describes a dishonest employee who, when he realizes that he is about to be found out and fired, embezzles even more money from his employer in order to give out favors to various other people. The steward does this so that he will have friends to take care of him once he's fired, and the point of the parable is that we cannot serve two masters and that we should therefore give away possessions now while storing up treasures in heaven. The dishonest steward is presumably about to be fired because in the past he's taken from his master's wealth for himself. However, when he realizes that there's about to be a reckoning he steals not for himself but to help others, realizing that it will be only the care of others that will help him once he is jobless. I think few would take this tale of sharp dealing literally and conclude that we should embezzle in order to help others. But part of what makes the parable memorable is that Jesus takes a very realistic example of sharp dealing in the business world -- something his listeners would intuitively understand -- and reframes it to be a description of how we should relate to the next world and to God. 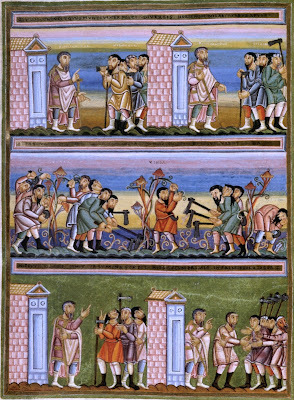 The Parable of the Vineyard is also dealing with the next life, as it states right at the beginning, "The kingdom of heaven is like..." Christ tells us that even those who come to "the vineyard" (which we take to be conversion and the life of following Christ) will receive the same reward (heaven) as those who have labored in the vineyard all day. This may seem unfair (as the complaints of the all-day workers indicate) but that's because we're judging by human standards in which we "earn" our rewards. Heaven is unearned. It is a freely given gift of God to all those who are willing to receive it. And because it is not earned but given, we are wrong to think we can quibble about whom it is given to based on who "worked more" for it. The words of the vineyard owner are key here, "My friend, I am not cheating you. Did you not agree with me for the usual daily wage? Take what is yours and go. What if I wish to give this last one the same as you? Am I not free to do as I wish with my own money? Are you envious because I am generous?" The vineyard owner has complete dominion over his money. He gives it as he chooses. The workers who have worked all day are in no position to argue with him as to how he disposes of his money because they have no right over it. Now this is where turning around and using the parable to talk about actual labor markets gets interesting. In a sense, the parable assumes what we might describe now as a libertarian attitude towards work and payment. The vineyard owner tells the all-day workers that they have no right to question how much he pays the other workers, because they have received as much as they agreed to work for. If he is generous to the others, that's his business. The implication is that the money of the vineyard owner is totally his own, and as long as he fulfills his explicit agreement with the all day workers, they have no ability to question his actions. Let's take another example of wage dissatisfaction which social justice advocates often point to: A worker is slogging away earning $10/hr which is the wage that he agreed to when he took the job. Then he finds out that the CEO of his company is being paid $20,000,000/year, on the order of a thousand times as much. Why, he asks, is that person paid so much when I'm paid so little? In this case, the answer, "My friend, I am not cheating you. Did you not agree with me for the usual daily wage? Take what is yours and go," is not going to be very persuasive. Indeed, I think we can probably agree that the wage structure of the vineyard owner would not pass muster with any labor union negotiating a vineyard maintenance contract. And yet, unionization is often advocated by Catholics as a means to achieving greater social justice. Heaven is utterly God's to give. We have no right to heaven. We have not earned it. God does not have an obligation to us. It seems to me that implicit in our sense of fairness in a situation like this is an idea of a certain amount of social ownership of the money to be used as wages. Say the owner has $1000 with which he is to pay ten workers. Workers are going to expect to that the money available for wages be divided in some fashion which matches their sense of fairness. Let's talk about an imaginary vineyard. This vineyard pays $10/hr and hires laborers to work days of up to twelve hours. (Hey, it's ancient Israel. Life is hard.) Five workers are hired at 6:00 AM to work a full day. Five more are hired at 9:00 AM. Five at noon. Five at 3:00 PM. Five at 5:00 PM. The work day ends at 6:00 PM. 155 man hours have been worked. The expectation is that $1550 will be paid out at the rate of $10/hr. If the vineyard owner instead pays out $3000 (giving each of the 25 workers a full day's pay of $120) he sends to the workers the message that the pot of money to be divided for the day's work is not $1550 but $3000. Here's where I'd argue that the sense of fairness which we might normally identify as right-leaning in our politics works of a sense of social ownership and responsibility which more left-leaning people should understand. When the workers realize that there is a larger pool of money to be divided, they believe that it should be divided according to rules which they consent to via their sense of fairness. They don't think that the money is strictly the owners to do with as he sees fit. If he decides to pick out five of the workers at random and pay them far more than the others because he likes their looks, the other workers will be angry. Even if they don't have any formal process of negotiating how the money is to be distributed, they want the money divided in a way that they can consent to as being just. Not only just in the sense of "it's his money, he can do what he wants with it" but in the sense of "that is a manner of division which I can agree with." Now, what triggers the desire to re-negotiate the division of wages in the parable is when the vineyard owners effectively puts a bigger bag of money than expected on the table. The workers expected $1550 to be paid out. When he goes to pay out $3000, they feel that they should have a voice in how that money is divided. They feel that they should have an opportunity to renegotiate the terms of their employment. If the owner had stuck to the acknowledged hourly wage, probably no questions would have been asked. There's an implicit agreement that the wage represents some compromise between how much the vineyard produces and how much the workers need to get by. But various things might break the equilibrium, and what is perceived to break the equilibrium could vary depending on someone's politics. For instance, in our modern world, if a company produces very high profits or pays its executives very high salaries, some people (many of them on the left) will take that as an indication that there is money on the table, and they will want a chance to negotiate how that money is divided. In this news story about Gravity Payments and its $70k minimum wage, there was apparently a sort of equilibrium in which people were making their old salaries and the owner and his brother were both making about $1 mil per year while also earning profits of over $2 mil. However, the status quo with $4 mil going to either executives or profits was accepted until the owner decided to take a significant portion of that money and use it to increase the salaries of the lowest paid employees. Then, some employees decided that they wanted their voices heard in how that "extra" money was to be divided. Obviously, the sorts of things which people consider to put money "on the table" will vary, and the sorts of distribution which people consider fair will also vary greatly. But what I do think is fairly universal is that people have a sense of fairness which does not actually see an employer as having absolute ownership and discretion over the money he spends of wages. In the human world, the vineyard owner's argument for why the all-day workers should not object fails to address this sense of fairness, because the analogy which Jesus is making to to salvation, something which is in no sense earned. As such, comparing workers to object to some new salary arrangement at a real life company to the grumbling workers in the parable is not actually a very good rhetorical move. The parable is not about whether heaven is a gift or not. The question is who has the authority. Jealousy and authority are also what many other questions revolve around; they are the counter-intuitive centerpiece of everything from the Fall to the Cross and onward. In this case, the vineyard owner has the authority; the earlier workers have jealousy. He has bound himself to pay them their due; and has continued to create obligations through the day. But they would like not so much to increase their own as decrease someone else's. That is a usual sign of jealousy as opposed to simple greed. It is natural to oppose the legitimate authority. What isn't as widely acknowledged as it should be is that 'social justice advocates' generally do not want to accept the authority of the employer over the money or the laborer over his time, but instead arrogate all the authority over both parties to themselves. Framing the question in terms of authority - that arrogance sounds rather familiar. Regardless of the stance of the Church at various times, I'm not convinced union leaders fare better. Given the excellent analysis of the economic versus salvific nature of the Parable of the Vineyard here, I suppose that an interesting way to expand it – especially in light of the Gravity Payments story and larger minimum wage debate – would be to examine the utopian "immanentize the eschaton" and historic 'Social Gospel' elements in the progressive economics at play here. I imagine that the tension of the two dynamics are not only at play in the literal vs. allegorical understanding of the parable but in the the modern debate on wage issues themselves and how Social Justice is understood. I find it interesting that the author says the parable is an imperfect analogy. The parable was given by Jesus. If you are a Bible believing Christian that's about as perfect as an analogy can be. Ahem. Darwin said that it's an imperfect analogy to the question of modern wage disputes. Since the parable is really about the kingdom of heaven, as Darwin points out Jesus explicitly opens the parable with "the kingdom of heaven is like..." trying to apply it to how to pay employees fairly is an imperfect analogy for the purpose the author of the original piece was using it for. It would also be a really bad analogy if I were using it to try to describe how to wash a dog. The fact that Jesus told the story doesn't make it universally applicable in all situations, it's only perfect in the sense that Jesus meant it.